Easter morning has never been so sweet! Start the day off right with these classic cake-inspired pancakes. And since they're chock full of carrots, we like to think they're on the healthier side, too. Kids and adults alike will swoon over the sweet cream cheese icing-topped flapjacks. You can whip them up in no time at all—just pop the carrots in your food processor instead of wasting time with a hand grater. Other than that, it's just a few ingredients to whisk together. If you have a large cast iron griddle, you can easily make eight at a time to feed a hungry family. Top them with chopped pecans and more grated carrots for color. You can even add the chopped pecans into the batter if you like the nutty texture. Try toasting them for even stronger pecan flavor. Whisk together the melted butter, milk, egg, and vanilla in a measuring cup. You can melt the butter in a measuring cup and then add the rest of the ingredients on top of the butter. Make sure to add the milk before the egg, so the hot butter doesn't scramble the egg. Whisk the wet ingredients into the dry ingredients and continue to combine until there are no large lumps left in the batter. Grate the carrots finely either in the food processor or with a grater. Add the grated carrots and spices to the batter. If the batter is too thick, add some more milk a tablespoon at a time. Heat a griddle on high heat. Grease the griddle liberally and once it's heated through, turn the heat down to low. You want to cook the pancakes on medium to low heat so they cook evenly without burning. Cook the pancakes for a few minutes per side, or until golden brown. Whisk together the cream cheese icing ingredients in a medium bowl with a hand mixer. Beat until smooth and no lumps remain. 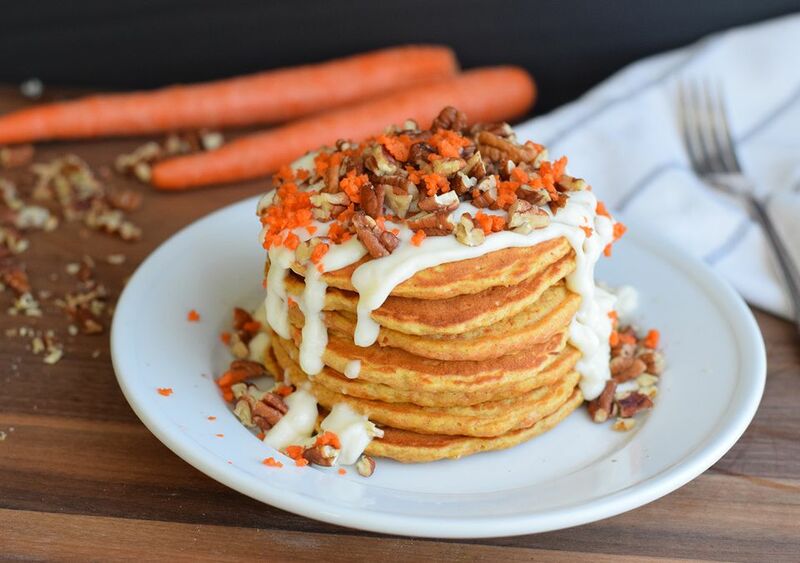 Drizzle the cream cheese icing over the top of the pancakes and then top with more grated carrot and chopped pecans. Use whole wheat flour in place of the regular all-purpose flour to kick up the fiber to an even higher notch. Use regular maple syrup along with the cream cheese icing for extra sweetness. Add another 1/3 cup of chopped pecans to the pancake batter to make it even more carrot cake-y. Add 1/4 cup of crushed pineapple to the batter at the same time as the shredded carrot, which is often used in some carrot cake recipes as well. This will add moisture, so add an extra tablespoon of flour if needed.